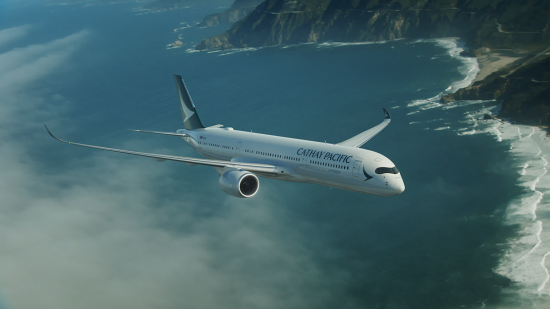 Cathay Pacific Airways today announced the addition of three non-stop flights between Vancouver and Hong Kong, using the new state-of-the-art Airbus 350-900XWB aircraft. From 28 March, 2017 three flights will be added to Cathay Pacific’s existing twice daily non-stop service, increasing the frequency from 14 to 17 flights per week – more non-stop flights to Hong Kong than any other airline. These three additional early morning departures on Tuesday, Thursday and Saturday will provide West Coast passengers with unprecedented travel options to the award-winning Hong Kong International Airport and beyond to multiple destinations in Asia and over 23 cities in Mainland China. According to Cathay Pacific Vice President Canada, Nick Hays, the additional services are responsive to increased demand for travel to and from Asia. “It’s exciting to be able to grow our operations in Canada,” said Hays. “As a China and Asia travel specialist, it’s our pleasure to provide more choice, convenience and world-class service to passengers travelling between Vancouver and Hong Kong and beyond to our unrivalled Asia and China network,” he added. Cathay Pacific will operate the three extra flights with its brand new Airbus A350-900 aircraft featuring a refreshed Business Class cabin as well as new Premium Economy Class and Economy Class seats. The features of Cathay Pacific’s new A350-900 take the passenger travel experience to a new level. The design of many of the cabin features has been carefully considered to give passengers the best sleeping experience, the best entertainment, and to offer them greater control over how they want to use the space, whether for working or to relax. With its extra wide body, the aircraft offers more space and comfort, a quiet cabin, panoramic windows and LED mood lighting contributing to a more comfortable and relaxing journey in all cabin classes. The A350-900 Business Class seats build on the success of the airline’s award-winning long-haul Business Class product to create a memorable experience. Alongside a fully-flat bed, new features includes extra stowage space within easy reach and the personal service offered by a “Do Not Disturb” and “Wake-up Call” function in the entertainment system. The Premium Economy Class and Economy Class seats also come with a number of new features, including dedicated tablet holders that make it easy for passengers to enjoy entertainment content on their own devices, and exclusive power outlets and USB ports. Each Premium Economy Class seat has a fully integrated leg rest which, together with the ergonomically designed seat, allows more flexibility to adjust for optimal comfort. The six-way headrest in Economy Class is a proprietary design that provides better support and enhances sleeping comfort. The new A350-900 inflight entertainment system is inspired by the airline’s latest design philosophy. The interactive user interface is contemporary and fresh looking. It is equipped with notable new interactive features which broaden the inflight entertainment options for passengers along with a wider screen in all classes. Connectivity is installed for the first time in a Cathay Pacific aircraft, allowing passengers, for a fee, to browse the internet, send and receive emails and connect on social media. Access to the Cathay Pacific website, a number of partner websites and three live TV news channels is available free of charge. The A350-900 employs innovative technology and design which improves not only passenger comfort but also the efficiency, effectiveness and overall performance of the aircraft. Its state-of-the-art design, together with the latest generation of engines and the use of advanced construction materials – including carbon fibre composites – deliver a 25% improvement in operating costs overall when compared to previous-generation aircraft. Powered by the latest technology Rolls-Royce Trent XWB engines, the A350 is the quietest among the aircraft types in its class and also 25% more fuel efficient. Since its first flight to Vancouver in 1983, Cathay Pacific has remained an industry leader by providing travellers with exceptional customer service, an unparalleled route network, superior in-flight hospitality and continual improvements to seat and cabin comfort to provide a better all-round flying experience.